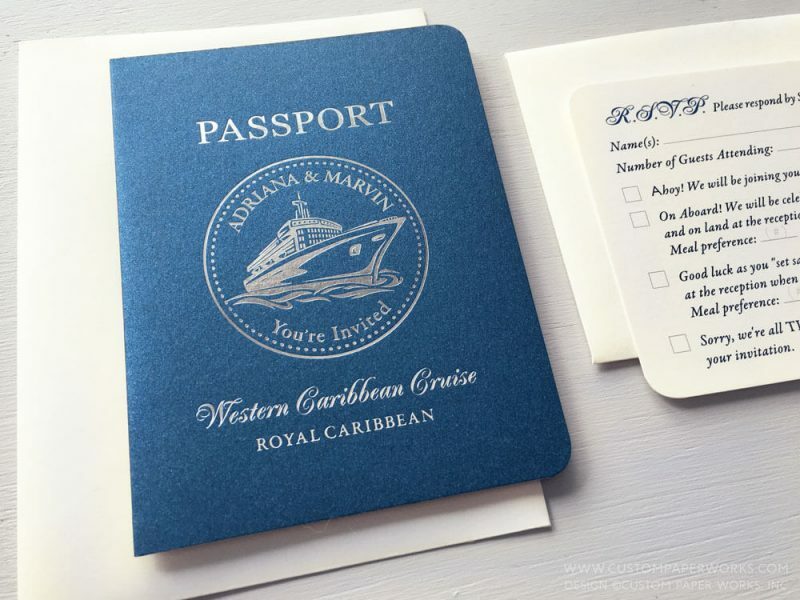 A wedding on a cruise is bound to be a fun event, and when the invitations are unique and elegant at the same time, your guests will be ready to book their tickets right away. 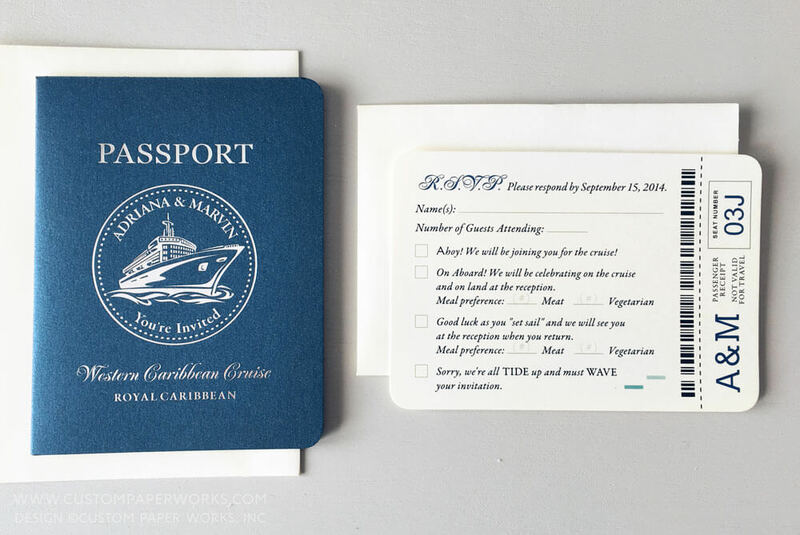 This couple opted for a blue, white and silver color scheme for a traditional preppy nautical look, elegant fonts for a formal touch, and creative nautical-themed wording on the RSVP card added some fun. 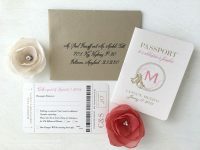 The Custom Paper Works LUXE Passport Invitation uses stationery-grade papers that are available in hundreds of colors, including matte and shimmer and other textures. The outer covers are colored card stock with a true, metallic foil stamped imprint (not digital foil, which can have quality issues). Mailing and RSVP envelopes are of equal stationery grade and can be color coordinated however you like – any color! (NOT basic white) and RSVP and return addressing is included, not an additional upcharge. Other fun extras already included in the base pricing of Custom Paper Works’ passport invitations: custom-designed, personalized passport stamps tailored to your previous or future travels, names and special dates AND design for custom postage stamps that coordinate with your invitation, which can then be ordered at Zazzle. The wedding took place aboard Royal Caribbean’s Oasis of the Seas. They can be designed for your cruise wedding taking place on any cruise line (local evening cruises too! ), with any color scheme and style that is uniquely yours. 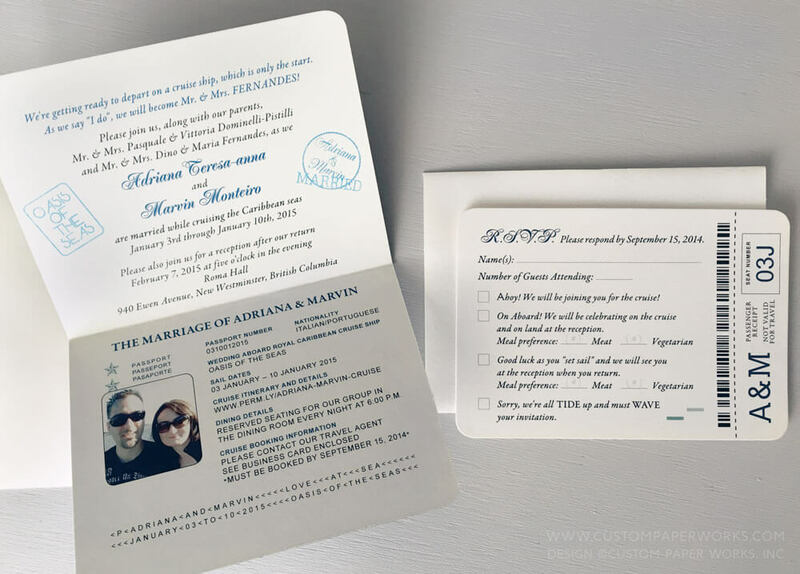 When you order a Custom Paper Works Passport Wedding Invitation, you aren’t locked into predetermined templates. 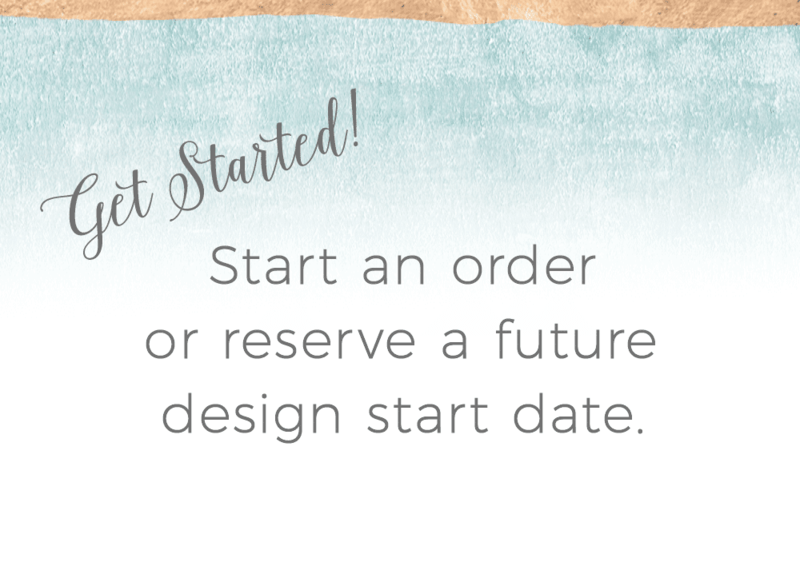 You don’t have to DIY ANYTHING (except actually stamping and sealing the invitations) and I am happy to help with wording and tricky planning situations. I’d love to create your cruise wedding passport invitation! Where are you headed?